A painting of a gorilla with a camera is among the pictures shortlisted for this year's BP Portrait Award. 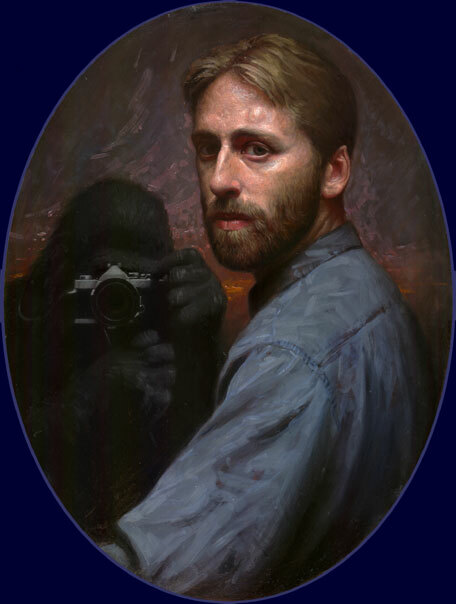 Monkey Painting by Conor Walton, which features the artist holding a gorilla, is among the four portraits shortlisted for the prestigious prize. The picture is the artist's updating of the 17th-Century monkey painting genre, in which apes were often shown in clothes or performing human actions. The winner of the 25th anniversary prize will be announced on June 13. They will receive a cash prize of £25,000 and a commission worth £4,000. Other works nominated include one artist's portrait of his girlfriend and another's self portrait. Irish painter Walton's monkey portrait depicts him with Koko, a gorilla who learned to do sign language and can understand spoken English. Walton, 34, says he is fascinated by monkeys, who he sees as "evolutionary reprobates" who avoid progress by staying in trees. "I feel a strong kinship with the apes, being myself an evolutionary reprobate: a monkey painter, still aping nature when 'photography can do the job better', resisting new media, abstraction and the latest trends - a hopeless case," he says. London-based artist Dean Marsh, 36, has also been shortlisted for the prize, which is open to entrants under the age of 40. Marsh, who says that he "doesn't flatter" and "tries to be honest" in his portraits, spent six months painting his girlfriend Giuletta Coates. Gregory Cumins, 31, depicts the acclaimed British sculptor Richard Deacon, who taught him sculpture. Saul Robertson, 26, from Glasgow, has painted himself in his painting garb in The Universe. Out of this year's record 1,081 submissions, 53 portraits - 40 from the UK - will be displayed at the National Portrait Gallery in London in June before touring. Art critic Brian Sewell is among the judges, chaired by National Portrait Gallery director Sandy Nairne. Mr Nairne said: "This is an excellent shortlist, chosen from a strong field - 2005 will be another fascinating array of contemporary painted portraiture."